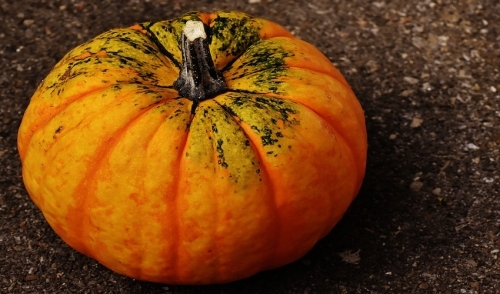 Create Compost: Pumpkins can be easily added to a compost pile. Cutting or breaking the pumpkins up will help them decay faster, so they are ready to add rich nutrients to a spring garden or flowerbed. Make an Easy Bird Feeder: Cut a carved pumpkin into halves, fill each one with birdseed and you have an impromptu bird feeder. Birds will also nibble on the pumpkin's flesh, and they don't mind if it's a bit soft. Offer Farm Feed: Offer old but still somewhat firm pumpkins to a local farmer as a treat for cattle, pigs or other livestock. While animals shouldn't consume completely rotted pumpkins, fruit that is just becoming soft is still suitable. Provide Zoo Treats: Many zoos or wildlife rehabilitation centers may be able to use older pumpkins as treats or entertainment for their residents. Sloths, apes, bears, fruit bats, meerkats and many other animals can enjoy pumpkins. Plant It: If you don't have a compost pile, you can still compost pumpkins by simply burying them in the yard. Choose any area that needs extra nutrients, or bury the decaying pumpkins in the garden and they will naturally decay. Study the Cycle: Turn a rotting pumpkin into a science project by studying the decomposition. Use different types of soil or different additives to speed or slow the process, and learn what affects how organic material decays. No matter how you decide to reuse a soft or rotting pumpkin, be sure there is no wax or ash buildup left on the fruit's flesh – it can be toxic to animals and will not compost well. Similarly, pumpkins should be free of paint, glitter or decorations. Once they are cleaned off, however, it is easy to turn a decaying pumpkin into something beautiful again as it is reused and recycled!